“After moving to the area, I was looking for a professional experience. 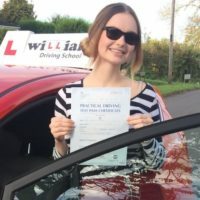 At first I was very nervous about the prospect of driving but my driving instructor Greg Braund gave me confidence in my ability which is vital in learning to drive! Greg had excellent teaching methods and he was very efficient in his ability to teach. Having come from another instructor I found Greg’s methods helped speed up my learning process and improve my overall driving ability quicker.